Welcome to the Couture Gel Nail Polish Starter Kit Giveaway! Big thank you to all of our other wonderful bloggers who have joined us in this giveaway! Mami's 3 Little Monkeys full review of the Couture Gel Nail Polish Starter Kit. One lucky reader will win a Couture Gel Nail Polish Starter Kit ($99ARV) with their choice of one polish color. This giveaway is open to US residents whom are at least 18 years of age at the time of entrance. Giveaway will end on April 22nd at 11:59pm CST. One winner will be chosen at random through the Gleam entry form, winner's entries will be verified. Winner will be notified via email in which they will have 48 hours to respond to or risk forfeiting your winnings and a new winner may be chosen. 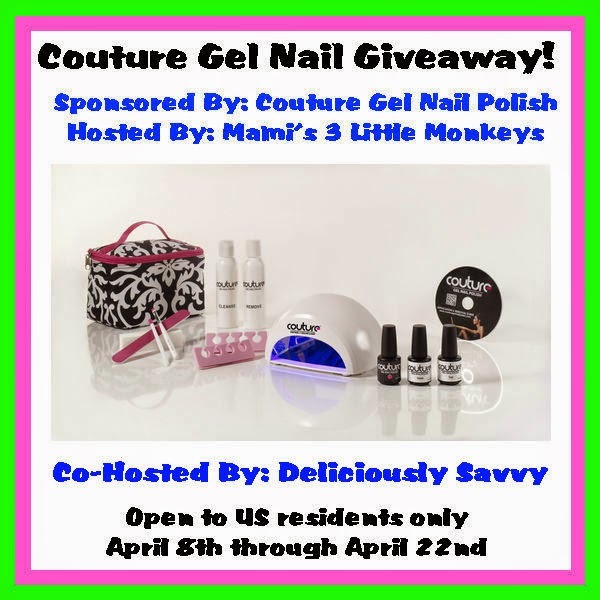 Disclosure: Mami's 3 Little Monkeys blog received a Starter Kit from Couture Gel Nails in exchange for our honest review. Mami's 3 Little Monkeys blog nor did any other participating blog receive compensation for this giveaway post. All information obtained in the entry form above will be kept confidential. Winners address will only be shared with the sponsor of the giveaway and only for the purpose of shipping the winner their kit. This giveaway is in no way affiliated with or endorsed by Facebook, Twitter or any other social media network. If you have any questions or would like to see your product(s) in a similar giveaway please feel free to contact Sarh at mamis3littlemonkeys[at]yahoo[dot]com.